Hampi is an eco-tourism area due to its unique terrain, flora and fauna. 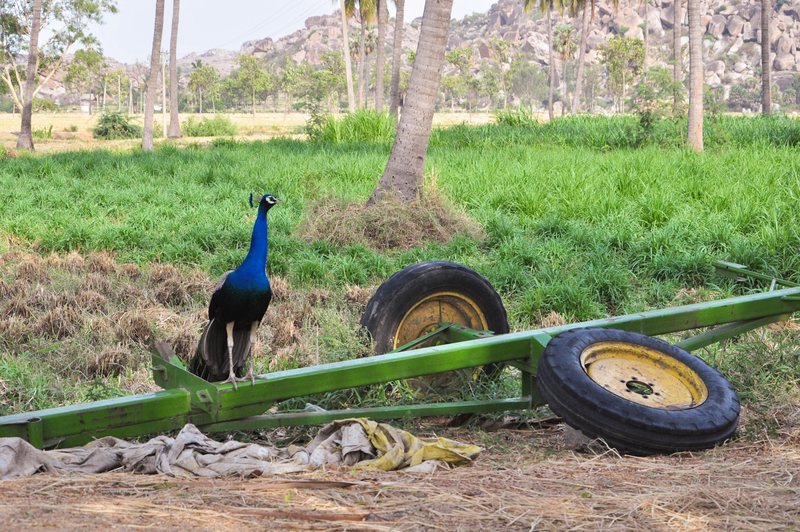 One of the secrets of Hampi is its precious wild life and birds. Any discerning visitor in Hampi would have definitely ‘discovered’ a white browed wagtail or a wire tailed swallow or a laughing dove, though not by their names but, the color of the beak or the wings, or the sheer size of the feathered friend. There is an estimated 300 species of birds in the region. We want to showcase this rich bio-diversity to the discerning traveller. Come with us on a tour as we walk through riverside, irrigation canals and agricultural fields, as we try to spot the birds accompanied by a naturalist. Our naturalist will have a birding binocular but we recommend travellers to bring their own. The tour is conducted on the northern bank of Hampi, we recommend that you find accommodation in Anegundi or Virupara Gaddi since the tour timing will make it difficult to cross the river. Pickup from and drop to your hotel is not included in the package. Please report to start location on time. If you need pickup/drop, we can arrange the same at nominal extra cost. Please let us know.